You will fall in love with this home and property. Pride of ownership shows. This is a place for and your horses with plenty of peace and quiet. 3 bedrooms and 2 baths. Open floor plan with laminate flooring throughout the living room, dining room and kitchen. Country kitchen with large picture window and eat bar. Wood stove to keep you warm during the upcoming winter months. Family room with French doors to large wrap around deck, wonderful for relaxing. 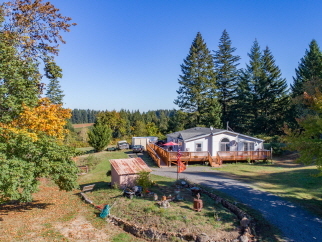 Private setting on 5 level acres. 2 stall barn, pastures that are fenced and cross fenced. Two 8x24 storage sheds. You will not be disappointed! Interior Features Open floor plan; laminate floors; country kitchen; living room; family room; French doors; wood stove. Additional Features and Amenities Pride of ownership and horse ready! Newer vinyl windows!